Like Facebook stalking? 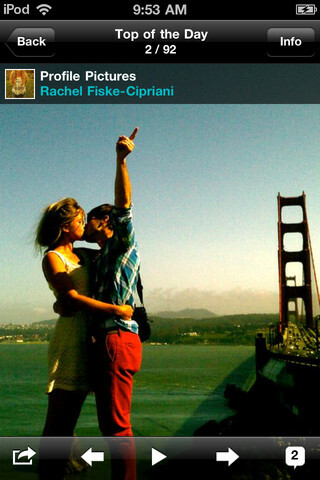 Pixable is an iOS app for iPhone and iPod touch (plus a separate iPad version) that lets you view pictures from your Facebook account as if they were a local photo gallery. Just authorize access to your Facebook account and Pixable starts to pull in photos and videos from you, your friends and around the web and presents them in a very fun and effective layout for you to enjoy. If you’re tired of having to log into Facebook to see if there’s any interesting photos posted, you’ll love Pixable. Think of it as an RSS reader for your social network pics. Categories in Pixable are fun and make a whole lot of sense. Pixable uses gender information from Facebook to sort photos giving you a folder of “The Ladies”, and another for “The Guys”. 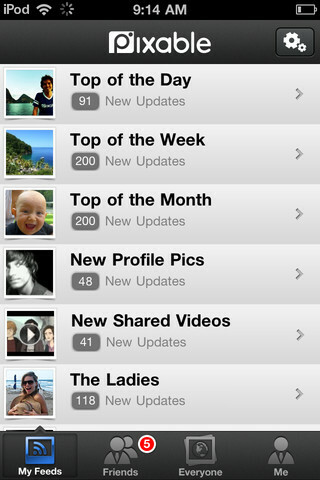 Pixable also uses the number of comments and likes to sort posts into categories like “Top of the Day”, “Best of 2010”, and “Top of the Month”. Other interesting categories (aka Feeds) in Pixable are: New Profile Pics, and My Likes and Comments. In the Me section, you’ll have your own photos and videos. You not only get to view pics you’ve uploaded by album, but can also see all the photos you’ve been tagged in by your friends in one place. On the iPhone there is also a tab called Everyone. In here you can browse photos extracted from various news sources and photography sites. Check out posters from movies opening this week, or view popular images from news articles on The Telegraph. Flickr, Instagram, Lomography, and Picplz are also included. Navigating Pixable is a joy although it takes some getting used to at first. Once you enter a single photo view, you can flick left or right as you do normally to see the pictures in the list. But you can also flick up and down, which then moves you to the next and previous photos from the set that the photo is from. This way you can dig deeper into a user’s pics and come back out. 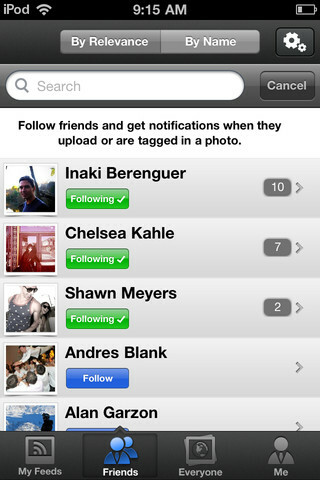 There is a concept of following people in Pixalbe which feels kind of annoying and a chore. But if you’re into serious stalking level, you can follow individual friends and get a push notification when they upload or get tagged. What is cool about the Friends section is that you can view all albums and photos by a specific user. When viewing a photo you can save it to your Camera Roll on the iPhone or iPad. It would be even better if the app allowed users to save a set of selected photos all at once. You can also email single pics as an attachment, post to Twitter, or even Facebook, which seems a bit redundant. You can read all the comments and Like photos here as well. The iPad app for Pixable is not exactly mind blowing and feels like it was rushed out the door. There is a ton of unused space in landscape mode. There is no Me or Everyone sections in the iPad version. It is nice to view the photos on a larger screen, but still I would give the iPad version a 3 star rating. It can use some serious work to can take advantage of the larger screen. Both the iPhone and iPad apps for Pixable are free in the App Store and are we highly recommend the download. AppSafari review of Pixable for iPhone and iPad was written by Joe Seifi on September 16th, 2011 and categorized under App Store, Featured, Free, iPad apps, Photos, Social. Page viewed 6033 times, 1 so far today. Need help on using these apps? Please read the Help Page.